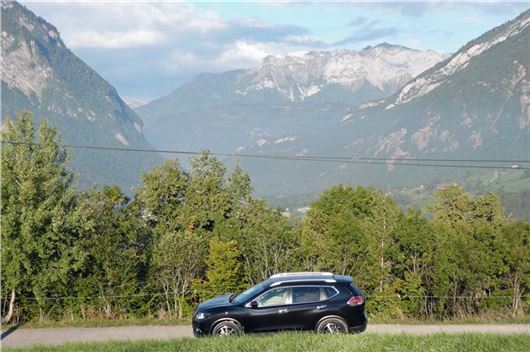 I diligently fitted patches to the ‘dipped’ lights of our 2014 Nissan X-Trail for a recent trip to Switzerland. I seek clarification as to whether this was necessary, given that the ‘dipped’ lights are separate Xenon fixtures, rather than built into the headlights. Our local Nissan franchise was unable to advise. Can you? Driving back on the UK side, I did wonder how many of the foreign trucks have their dipped lights adjusted for the UK? Point your car at your garage doors or at a wall tonight. Switch the lights on full, then on dip. If they dip down, you didn't need to fit the deflectors. If they dip to the left, you did. (This presumes you have now removed the deflectors.) Continental trucks usually have the facility to dip either way or to dip down. My sixteen and a half year old daughter is barely 5 feet tall and I am concerned that it is going to be very difficult to find any cars to consider buying in which she will be able to reach the pedals, whilst also not being perilously close to the steering wheel both from the car control and airbag deployment perspective. She recently sat in a FIAT 500 with the seat as far forward as possible and found she was a long way from being able to depress the clutch. Can you suggest a number of cars that she can drive in comfort and safety for us to look at. Might be better to go for an automatic. I had a 4' 11" wife who was fine in a Toyota Vios auto (which is a saloon version of the first generation Toyota Yaris automatic, up to 2005). Other possibilities are a KIA Picanto, Hyundai i10, Suzuki Splash, Vauxhall Agila. I took delivery of a new Discovery 5 three months ago. I had been very happy with it until this week when I had a puncture and found the spare wheel had been stolen. The retaining cable was dangling down, presumably cut while we were on holiday recently and the car parked “securely” at a hotel near Heathrow. Trawling the Internet I now find this is a frequent problem at that hotel. Also, on Land Rover Discovery forums, it seems a common problem with Disco 3, 4 and the latest 5, and that an aftermarket security device is available from JLR for about £70. Anyone contemplating buying a new Discovery should be aware of this and perhaps JLR should improve the design of the spare wheel retainer to make it theft resistant. I don’t yet know how much a new spare wheel, tyre and winch mechanism will cost but it probably over £1,250. Do you prefer Shell V-Power Nitro+ over BP Ultimate or is it car specific? In the last year or so, I have tried both but did not notice any improvement in mpg or performance over Tesco standard diesel. You will only get an improvement in mpg from super if you use the greater torque at low rpm to change up earlier, otherwise the engine will use exactly the same amount of fuel. (If it’s automatic you can use a lighter right foot and it will change up earlier.) The main reason for using Super is its detergent and lubrication properties that help prevent expensive fuel system problems and more than pays back the extra cost of the fuel. My son has a VW Touareg (the one with the built-in towing hook). It is running on Continental tyres, but after 12,000 miles the tyres need replacing – the back ones particularly. Is this usual? What tyres would you recommend as replacements? By strange coincidence I'd just been round the Continental Conti EcoContacts on my Renault Kadjar 4WD. At 19,250 miles the fronts were down to 4.8mm and the rears to 5.2mm, which indicates they should be good for another 10,000 miles. So I'd get a 4-way laser alignment check (alignmycar.co.uk) to see if there's a reason for the premature demise of yours. I’ve just carried out a pre Winter polish of my car and noticed a patch of pearlescence missing on a rear door. Looks like something very abrasive spilled on it. Can anything be done as a repair? This is the protective solvent-based clearcoat lacquer. Depending on how brave you are, you could get some very fine wet and dry, tidy up the edges, mask all around, and spay over with some clearcoat lacquer from Halfords. Or leave it to a car bodyshop. Don’t simply leave it because the colour coat is water-based and will eventually wash off. I have thoroughly enjoyed driving my Toyota Auris Sports Hybrid. It is now 3 years old with 43k miles on the clock. I am considering a change and wonder which equivalent cars I should have a look at? I own a 2012 Mercedes C250 Estate AMG Sport Plus with 45,000 miles. I have a full service history with Mercedes and I currently pay into their service plan. Recently (4th October) my vehicle underwent a major service that included a Transmission oil and filter change. A few days after the service, my vehicle didn't feel like it was changing gears correctly. I assumed it could have been contaminated fuel but eventually the engine management light came on so I stopped driving the car. I called Mercedes and explained the problem and they asked me to bring the vehicle in for a diagnostic check that would cost me £110. I was reluctant to do this as I felt the vehicle was fine until they had serviced it. I got in touch with a local mechanic and he ran a diagnostic check for me and the errors that it was reporting was ''The gear is implausible or the transmission is slipping''. I called Mercedes back and they are still adamant that I will have to pay for the diagnosis and any repair that is required. Surely the problem has arisen from the service they carried out? I am unclear as to what my rights are in such a situation. Any help you can provide would be gladly appreciated. Make it plain in writing to the dealer principal of the MB dealership that you are not happy with this chain of events, that you think the problem is the result of them not having replaced the transmission oil at precisely the right temperature and pressure, and that you will pay for the diagnostic charge and for any repairs the dealer deems necessary, but will then resort to Small Claims in the County Court to sue for the refund of your outlay that you believe only occurred due to the negligence of the dealer in carrying out the oil and filter change. I’m really hoping you can help me. I am writing as the owner of a now two-year old four-door MINI hatchback. The car in question is my wife’s that we have owned from new and bought from MINI Park Lane. We have had no end of issues with the car. Most have been electrical ; the highlight being replacement of the whole wiring loom which required the car to be off the road for nearly three months. There has been a constant stream of electrical issues and, as a result of the car being dismantled and re-built, we have had issues of rattles and various things not fitting properly. I have raised this with MINI Park Lane and they have said they are not prepared to do anything other than repair the car as it is under warranty. My position is that the car is clearly faulty and they need to take it back at their cost, not mine. My wife has lost complete faith in the car, particularly as she drives our three children 10 miles to school every day. Just to add to the issues, for no apparent reason, the speedometer suddenly shot up to 90mph (when she was travelling at about 65mph) it stayed at 90 mph for 5 or 10 seconds and then shot back down to 40, where it stuck and a warning message came up. My wife is frightened of driving the car, it is unreliable and dangerous and we have no confidence in it. My wife has contacted the nearest MINI dealer in Salisbury (where we moved) who is sending someone out this evening. Meanwhile we have yet another day that we cannot use the car. Can I please ask you for some advice about how to deal with businesses like MINI as they are not listening. I don’t want the car anymore. On a practical level, we have an agreement to own the car for four years but, as it stands, the risk of owning the car beyond the warranty is just too great. On Wednesday 27 September, warnings lights lit up on the dash of my 53,000 mile 2013 Renault Megane, accompanied by sudden loud banging noises appearing to come from the bonnet. At the time I was driving along an A-road at approximately 50mph. It was recovered and the diagnostic assessment concluded that due to oil starvation, the engine and turbo both failed. 2 weeks prior to this, my car passed its MoT and was serviced (full service history). 3 days prior to this, my warranty expired. It may, or may not, be worth noting that in November 2015 my turbo blew and was replaced within the warranty period. I’ve been quoted a repair bill of £7,700 to cover parts and labour. I contacted Renault Customer Service and politely asked if there was anything they would be able to do to assist with my situation. A number of days later a manager responded to say they had ‘reduced’ the repair bill to £3,500. The cars resale value is approximately £4,000 and as it was on finance, I still owe £6,000 over the next 24 months. It can’t be written off due to there being no accident and I can’t afford £3,500 in one transaction. I have explored all avenues and it seems I’m in a lose-lose situation. Other than taking out a payment plan for the repairs and authorising the repairs to go ahead, is there anything else I should/could do? Perhaps this is just an unfortunate situation, but I can’t help but wonder why a 4-year old car, 3 days out of the 4 year warranty, would experience oil starvation merely 3 weeks after an MoT and service. The answer is that you have been switching off the engine when the turbo was too hot. You should have idled it for 30 seconds to a minute. The result will have been that the oil feed pipe to the turbo and the oil return pipe will have become choked with carbon cutting off the oil supply to the turbo bearing. These pipes should have been replaced when the first turbo was replaced and the likelihood they weren’t coupled with not regularly checking the oil level is a possible reason for the engine failure. I have a small company car and my wife has the larger car for longer trips. We have had 6 CR-Vs on the trot and it is coming up to the time to part-exchange the current one. They have all been great with no breakdowns at all. However there must be other SUVs that are worth consideration. What do you suggest? Mazda CX-5 (but petrol limited to 2WD and no petrol auto); VW Tiguan (really good looking now), SEAT Ateca, Skoda Kodiaq, Skoda Karoq, KIA Sportage 1.6T-GDI GT AWD; slightly smaller, a Suzuki Vitara S 1.4T Booterjet AWD; if you don't mind diesel I've just completed 20,000 miles in a Renault Kadjar 1.6 DCI AWD that has been excellent and still feels extremely robust (on sensible 205/60 R17 tyres). There are a lot of alternatives out there. If thinking diesel you could also consider a Honda HR-V 1.6iDTEC that at 58mpg is probably the most economical SUV. I read your column each week and have been meaning to ask you about something we recently experienced with a new Renault Trafic Van. We purchased it new in March 2016 along with another [same model, same age] both were plylined by Renault before delivery and both had locking issues with the sliding side door and had to go back in to have this looked at. On 4th November our employee stopped to pick up a colleague who opened the sliding door, threw in his bag, closed the door and the driver set off. Immediately he had the alert that the door wasn’t properly closed so he pulled over, got out of the vehicle to close the door, only to find the door had slid right off and was in the road. I argued for 10 weeks with Renault as, in my opinion, this should not have happened. There is a safety block to stop this happening. They told me they had tested the lock and found no fault – though how this could have been done is beyond me as the door was tied to the vehicle with rope and couldn’t have been fitted to test it. At one point they decided the issue was the plylining and that something hadn’t been installed properly afterwards – this was swiftly discounted when I explained that the Renault dealership had carried out the ply lining – not us! They then decided that it was driver fault – that the vehicle had been driven with the door open. Our vehicles have tracking devices so I could see exactly when this happened and the speed and timing involved. I could see he had immediately realised and slowed down - The max speed he had reached was 12mph. Renault refused to admit any liability and closed the case and I had to claim via our insurance in the end but it still niggles. This shouldn’t have happened. When he braked, the door would have slid back to the closed position [even if it didn’t latch] but it had already obviously slid off the runners. If any vehicles or pedestrians had been on the road it could have been disastrous. I would be really grateful for your opinion – don’t know what I can do as Renault refused to listen to me. Have you heard of this previously? Will add to the Trafic entry in our vans section. I think you should take the matter to Small Claims against the Renault dealer who sold you the van and carried out the ply-lining, not Renault. In UK law it is the supplier who is directly liable, not the manufacturer. See: /faq/consumer-rights/ About 15 years ago a neighbour had a Mercedes V-Class. We both had steep sloping drives. He opened his sliding side door and it shot off across the road and into another neighbour's garden. Re V-Power vs BP Ultimate: I use Super Unleaded in my 2004 Jazz (to prolong the life of the engine) and got no better MPG with V-Power - and some instances worse - than running on supermarket unleaded. By contrast BP Ultimate gives me 20-50 miles more per tank. I mostly use my car to commute between Cardiff and Bristol and so this equates to an extra one way trip - very handy.